Say that three times fast…I have been seeing many recipes lately using brown butter with both sweet and savory ingredients, so I thought I might give it a try. Browning butter gives it a nutty deep flavor which pairs nicely with almond flour. I have used my wheat free flour mix here so this is a great dessert to make for your gluten-free friends and family. 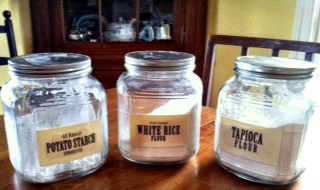 I keep this mix on hand in my pantry – the almond and coconut flour I keep in the refrigerator. 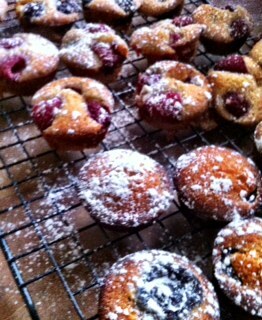 I have filled the cakes with raspberries, blackberries or prunes. The berry cakes take a bit longer to bake than the prune, due to the added moisture, so best to do all the same per batch. This batter keeps well for a day or two in the refrigerator – bake them during dinner for a special treat fresh out of the oven.. This entry was posted in Recipes and tagged Almond flour, Baby Cakes, Blackberries, Coconut Flour, dessert, Gluten-Free, Prunes, Raspberries, wheat-free flour mix. Bookmark the permalink.